A Scrub even TLC would love! It’s no secret that I have an ongoing battle with dry sensitive hands which are also prone to eczema *sigh, all the pity please ;)* so I was really intrigued when Kirsten at Beauty Kitchen contacted me to ask if I’d be interested in trying their Wake Me Hand Scrub*. 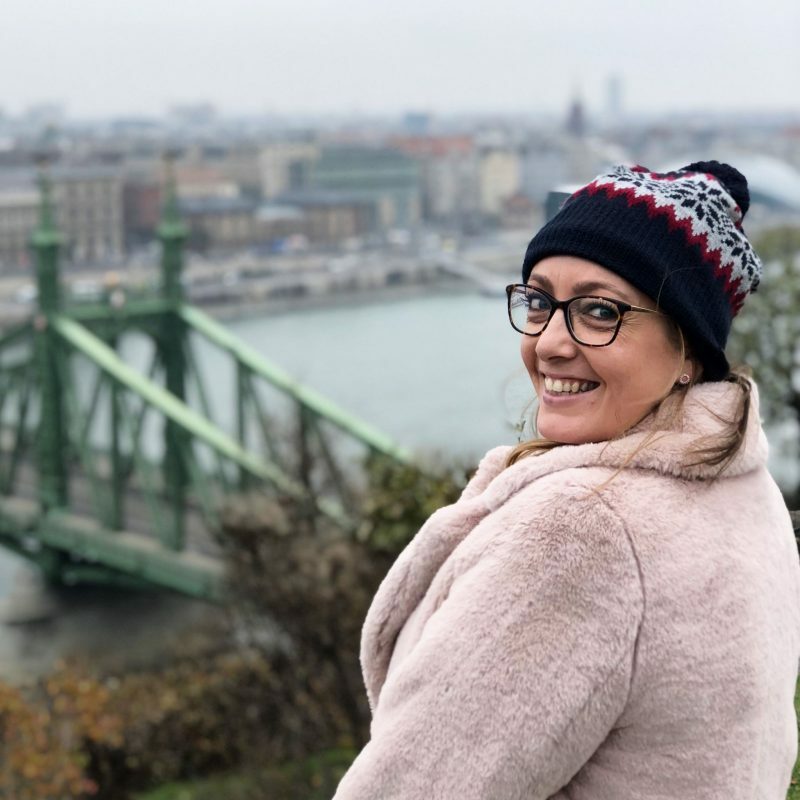 Kirsten explained that their products are made with completely natural ingredients, with no hidden nasty parabens or chemicals, so are perfect for sensitive skin like mine. I’ve never tried any kind of hand scrub before, or really used any 100% natural products, usually just nipping down to my local Superdrug for creams etc. so I was really excited to give it a whirl, especially as it promised to be skin smoothing and renewing – just what my little paws need! 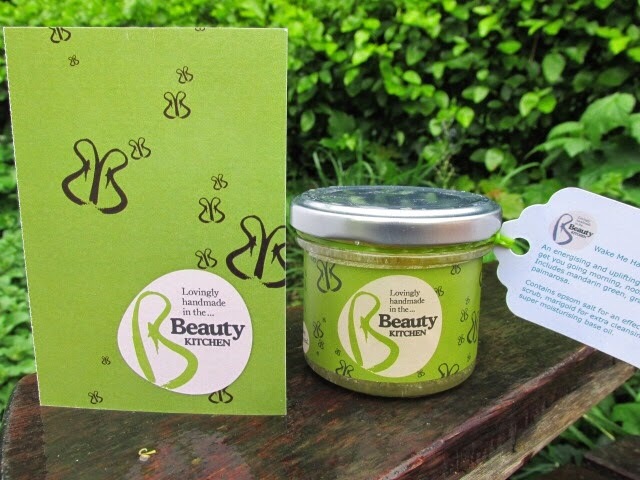 Beauty Kitchen is a Glasgow based company which only uses 100% natural and ethical ingredients in all of its products, as well as using only pre-cycled or recycled packaging. I adore the name Beauty Kitchen and the fact that their products are lovingly handmade to order by their “creative chemist” who once trained as a chef! How cool is that?! An energising and uplifting zingy mix, it will get you going morning, noon or night. Ingredients: mandarin green, orange sweet, grapefruit, benzoin resinoid, lemon, palmarosa. 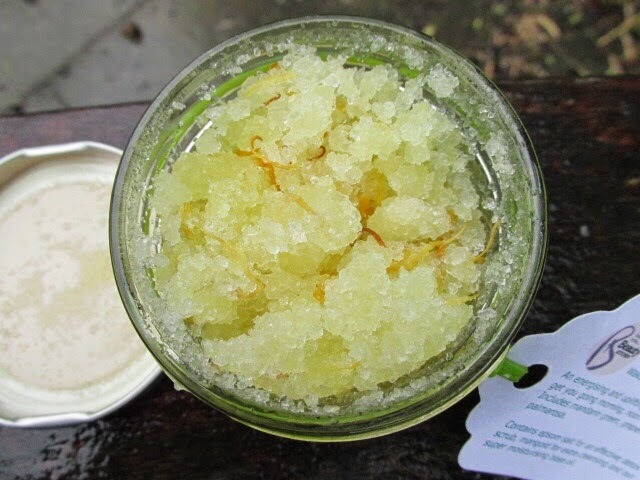 Contains Epsom salt for an effective detox scrub, marigold for extra cleansing and our super moisturising base oil. Sounds pretty good eh! I love bright refreshing scents so this is perfect for me, but you can also choose Arouse Me, Chill Me, Inspire Me, Love Me, Refresh Me and Spoil Me. The Wake Me Hand Scrub arrived on a little bed of bright yellow and green tissue paper which gave me a bit of zing before I’d even opened the tub! The Scrub comes in a lovely little jam jar which really emphasised the fact that this was a lovingly handmade product rather than your bog standard mass produced drug store stuff. You can smell the zingy Wake Me fragrance as soon as you open up the jar, though it’s not overpowering, and there are lovely big shreds of orange and lemon zest visible in the mixture. The label explains to massage a teaspoon of the Scrub mix into wet hands, focusing on dry areas and the base of the nails, then rinse with warm water and pat dry. So easy! A little bit of Scrub goes a long way too as obviously whilst rubbing it into one hand, the other is still getting a good bit of treatment as well. My hands instantly felt a lot softer after using the Scrub, and my skin looked visibly smoother and fuller. I get very dry skin in between my fingers, which can sometimes look white and cracked (gross, I know, sorry!) 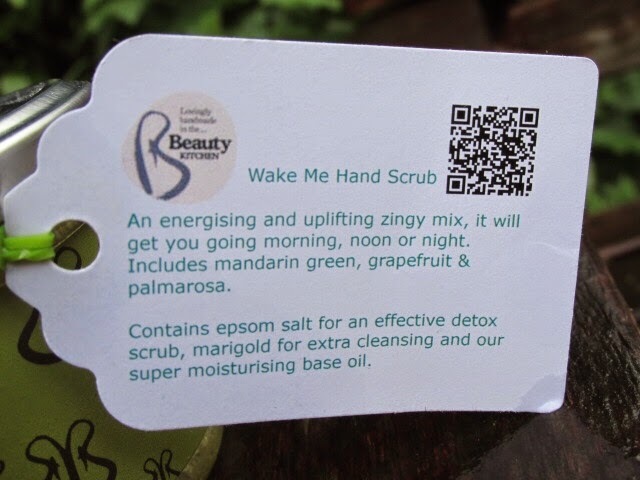 but after using the the Wake Me Hand Scrub this was gone, and the dry, papery looking skin on the back of my hand also looked so much healthier. The softening of the skin lasted for a good while too, as I noticed when I put it on before bed and still had lovely soft mitts in the morning! I did notice however that my hands, although much softer, did feel a little bit tight after using the Scrub, presumably because of the need for water in applying it, so I’ve started applying a small blob of my usual moisturiser afterwards too. 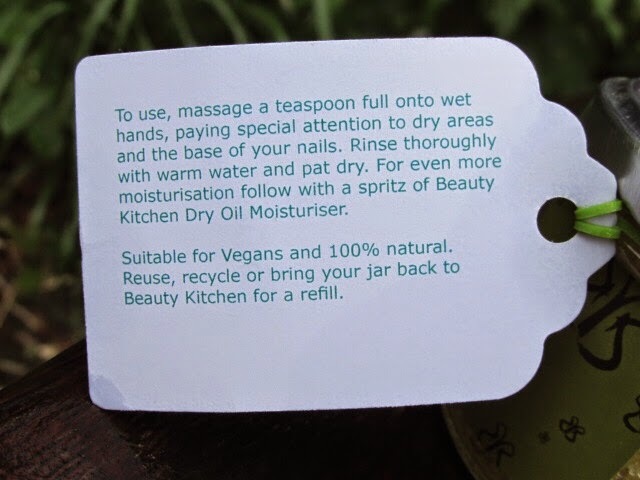 Sadly this isn’t a natural one though so I think I need to look into the Beauty KitchenDry Oil Moisturiser, which is recommended on the label. The Beauty Kitchen Wake Me Hand Scrub is £9.95 for a 100ml jar, which I think is a really good price for a product made of 100% natural ingredients, with no hidden chemicals or parabens. I love that you can personalise your product to the scent which suits you and the idea that each jarfull is hand made by the in-house chef. As well as getting some good beauty blogger karma by using a completely natural product made from local ingredients, it’s also great to know that nothing has been tested on animals, and that the packaging is environmentally friendly too. A big (very soft and invigorated) thumbs up from me! 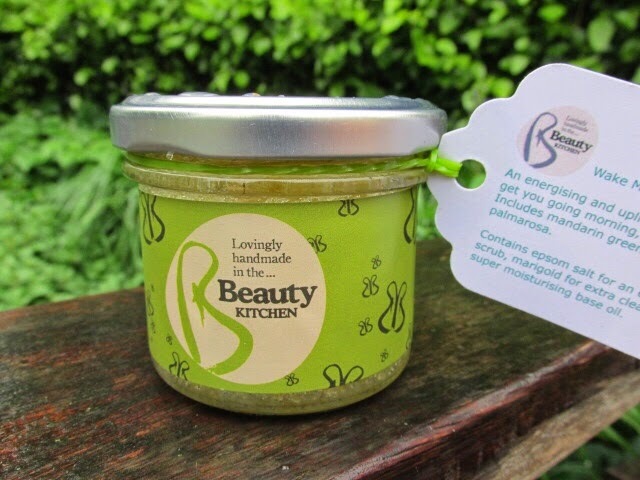 You can find out more about Beauty Kitchen and see their full range of products on their website www.beautykitchen.co.uk They also have a shop in Glasgow where you can go and make your own cosmetics! I think this Londoner needs a road trip….! Have you tried any Beauty Kitchen products before? Do you consciously use natural beauty products? 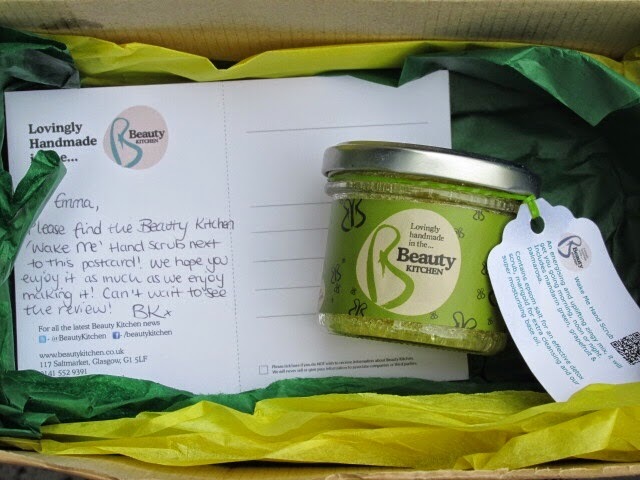 *Thanks so much to Kirsten and Beauty Kitchen for kindly sending me the Wake Me Hand Scrub for review. All thoughts are honest and my own. For more information please see my Disclaimer Page.